It's funny the things you end up missing as an expat. Who would have imagined that glace cherries would be among them? But I haven't been able to find those ridiculously sweet and sugary candied fruits in US supermarkets, until a few weeks ago when I found a pot in DeLaurenti, Seattle's legendary Italian deli. So the Minx and I set to with a will to make Nigella's Cherry Almond Loaf Cake from How To Be A Domestic Goddess, mostly so that the Minx would get to experience that quintessentially British childhood cooking experience of shoving as many sickly sweet and sticky cherries into her gob as humanly possible. 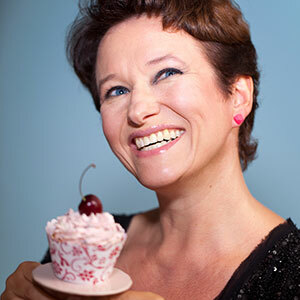 It is no coincidence that Jane Brocket from Yarnstorm's new book on classic childhood cooking will be entitled Cherry Cake and Ginger Beer. Note that my precious cherries were of the traditional lipstick scarlet variety and probably full of unmentionable additives. Nigella suggests using the more natural dark red ones, and yes, Nigella, I would if I could. Cooking from a UK book in the US is not without its challenges. You will notice that UK books use metric measurements instead of cup measures (to which I have become entirely converted since living here). So I first had to fiddle with my scales to stop them weighing in pounds and ounces. (The hyperlinked recipe above gives quantities in cup measures, presumably from the US version of HTBADG). Self-raising flour also doesn't exist in the US, so I had to refer to the Internets to find out how to make it from plain flour (add 1tsp of baking powder to every 125g/4oz of flour according to Good Housekeeping). And then I had to use the Internets again to find out how to convert centigrade temperatures to Fahrenheits. Can someone somewhere please unify all these measures immediately? It really is doing my head in. But the resulting cake is one of those quietly delicious cakes that you appreciate much more in adulthood. I had to add a brown sugar crust (not exactly a hardship) to appease the Minx's disgust at the lack of 'sprinkles'. And yes, the cherries did sink towards the bottom of the cake, as is only traditional and right. Is self raising flour a peculiarly European thing? I had no idea! If I remember from my researches, it’s a peculiarly British/ex British Empire thing. Which I wish I’d known before searching for it all over here in the US. Though given that it’s just flour and baking powder (to which you often have to add extra baking powder) it does seem like a slightly pointless convenience food. There are definitely UK and US versions. But if they didn’t think to alter the ‘self-rising’ (funny how it’s called that in America) bit then seems like very bad editing to me. Unless ‘self-rising’ flour IS easy to come by here and I’m just being foolish. Anyway, the proportions given above seemed to work very well for this cake, so I’d use them in future for any recipe calling for self raising flour. Not sure what the cup equivalent would be though. I know! I thought that they’d at least convert the self-rising flour to all purpose flour + baking powder equivalents. That is probably my biggest gripe with this book. These cherries are easily found during the xmas season in any supermarket in the U.s. They even come died green, too. (that red color sure ain’t natural, so the green is no more unnatural) Look for them in the baking aisle, with the chocolate chips, candy sprinkles, etc. Ooh, thanks for that tip. I’ll look out for them. And the idea of making a cherry cake with acidulous green cherries is too tempting to resist. a) the UK HTBADG version does not use metric for some reason. It uses exactly the same measurements as the US version. In fact there is NO version of HTBADG using metric which I found incredibly frustrating as I would prefer metric even though I live in the US now (orig. from Kent). b) self-raising flour (UK) = self-rising flour (US). Self-rising flour can be found right next to plain flour in most major US supermarkets. Almost always in the 5 lb size and hardly ever in smaller or larger bags. The brands and the packaging are almost identical to the plain flour so may be easy to miss. c) glace cherries are indeed everywhere at christmas but can also be found year-round at many major US supermarkets. They are sometimes in with dried fruit, sometimes near canned almond paste, sometimes near chocolate chips, often on a top or bottom shelf, making the difficult to spot. But in the US, I’ve never seen natural glace cherries only the dyed ones. Your loaf cake looks divine! !